XI’AN (FIBA 3×3 U23 World Cup) – FIBA was announced on July 17 the Chinese city of Xi’an will host the brand new FIBA 3×3 U23 World Cup on October 3-7, 2018. Uganda will be the only African Country in the Ladies Pool as it has been in the U23 Nations League. 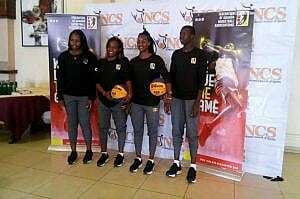 Africa’s top ranked 3×3 player Jamila Nansikombi leads Uganda’s team of four. She is joined by JKL Lady Dolphins teammates Hope Akello and Ritah Imanishimwe as well as the youngest player on the team Jane Asinde who turns out for Magic Stormers. “After the successful launch of the FIBA 3×3 U23 Nations League last year, the FIBA 3×3 U23 World Cup was the next logical step,” FIBA Secretary General and IOC Member Patrick Baumann said. The FIBA 3×3 U23 World Cup will be organized by the Chinese Basketball Association (CBA) in cooperation with the ShanXi Province Basketball Association. Twenty men and 20 women’s teams will meet in Xi’an. Besides the team events, there will be 3 individual contests: the Shoot-Out Contest (mixed), the Skills Contest (women) and last but not least the Dunk Contest (men). “We are glad to bring the FIBA 3×3 U23 World Cup for the first time in China. I hope that our Chinese players will be trained and improved. The development of China’s 3×3 program will also be promoted at this event.” CBA 3×3 Director Chai Wensheng said. “Xi’an is looking forward to making history by becoming the first-ever hosts of the FIBA 3×3 U23 World Cup”, Wang LiBin, President of Shaanxi Province Basketball Association said. Xi’an will be the capital of basketball in October as the FIBA 3×3 U23 World Cup will be held in parallel with the FIBA World Basketball Summit 2018. XI’AN (FIBA 3×3 U23 World Cup 2018) – The 40 participating teams (20 men’s and 20 women’s) were divided into 8 pools of 5 after the automatic seeding of the inaugural edition of the FIBA 3×3 U23 World Cup that will bring together the best 3×3 U23 teams in the world in Xi’An, China, on October 3-7 2018.